Since I read a lot of books about psychology, relationships, mental health and related topics, I will post reviews of books that I have read. This time I am writing about a book that helped me a great deal to make sense of the behaviours I have observed in many people I know. Although this book is targeted at women, I sincerely believe that there is a great deal of benefit for men interested in narcissism to read it too, if only to understand many of the young women they will meet on dates these days. This book opened up my understanding of narcissism more than any other single book. Karyl McBride writes with compassion as well as understanding for the people most of us prefer to despise in ignorance of their inner world. This book is directed towards women and focuses on the mother-daughter relationship and how mothers can have a devastating influence on their daughters self-esteem and outlook on life. Filled with plenty of real-life testimonies from women suffering from narcissism and narcissistic mothers it opens up a world that one does not usually see because narcissists cover up their genuine feelings and opinions. If you have a narcissistic mother, this book is simply a fantastic resource you will only be able to put down between periods of letting the revelations fully sink in. If you have to deal with a narcissist on a regular basis, then this book will help you to understand and deal with them with a clearer perspective. Parents concerned about how their emotional issues might be impacting their children can get something out of this book, but it simply is not written for them specifically. Teachers might find it intellectually interesting, but treating the types of narcissism described in this book are well outside the scope of the classroom. A guide to identifying different types of narcissistic mothers and daughters. A guide for understanding approximately how narcissistic one is. Detailed discussion with strategies about learning how to grieve and deal with emotional pain. Advice on relationships concerning how to find genuinely caring and understanding men as well as how to have a healthy and satisfying relationship with a man. Testimony to help understand the narcissistic mindset and the motivations between their destructive behaviour. Will I Ever Be Good Enough? By Karyl McBride, Ph.D.
Women who find themselves struggling in their romantic relationships, be it attracting a decent man or maintaining the relationship long term. Women who are overachievers who nonetheless feel deeply disappointed and dissatisfied with their lives. Men and women who have a cold, distant or overcritical mother and want to understand her better. Women with self-image problems and low self-esteem. Men struggling to comprehend many of the women they have dated who seemed perfect at first but turned into controlling, selfish manipulators by the end. This entry was posted in Adulthood, Books, Parenthood, Water Bird and tagged book, Karyl McBride, mental health, narcissism, Narcissistic, narcissistic daughters, narcissistic families, narcissistic mothers, Narcissistic parents, narcissistic personality disorder, Personality, self-esteem, self-help. Bookmark the permalink. 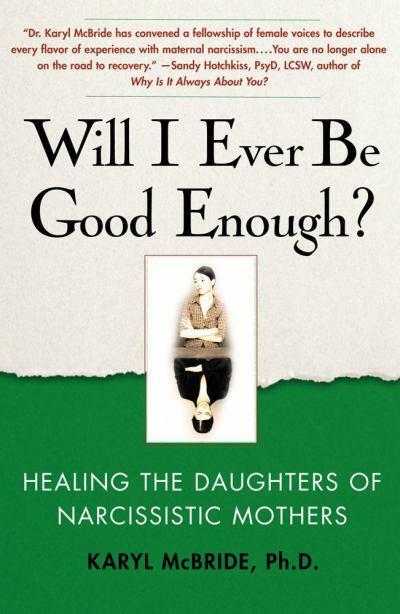 1 Response to Book: Will I Ever Be Good Enough?